First Hummingbirds Sighted at Casa Escondida B&B, New Mexico! They’re here! The sightings of the first hummingbirds marks the beginning of the New Mexico spring season here at our Santa Fe, NM area bed & breakfast, located in historic Chimayo, NM. Hummingbirds are one of my most loved birds of New Mexico. They also hold a significant place in Native American tradition, history, stories and art. These glittering, fluttering and fascinating winged-creatures, spend their winters in Mexico and Central America. They begin their arduous, northward migration in February and March and arrive at our Santa Fe area lodging establishment, just in time for our delightful spring weather (March / April). The presence of hummingbirds is a constant that begins each spring, continues throughout the summer and then concludes in the early fall. If you are a hummingbird lover, then a Santa Fe area vacation and New Mexico is for you! If you are a guest at Casa Escondida B&B during the spring, you are likely to witness the aerial acrobatics of the male hummingbird. He performs huge, swooping U-shaped flying patterns and is just a general show-off. All of this is to impress the female, for the purpose of mating. It really is quite the show! Throughout the state of New Mexico, there are 17 different species of hummingbirds that visit us each year. Some experts say 14 species. Others say 16 but no matter which number is correct, it’s a lot! 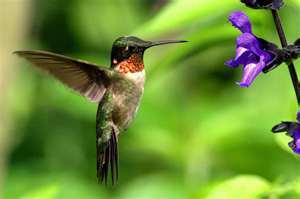 The four most common types of hummingbirds that you will see at Casa Escondida Bed & Breakfast are the Black-Chinned Hummingbird, the Broad-Tailed Hummingbird, the Rufous Hummingbird and the Ruby-Throated Hummingbird. All of these feeding hummingbirds dazzle and delight as they dart about, eating at the many nectar feeders that are located throughout the grounds of Casa Escondida B&B. The morning hours and the early evening hours (just before dusk) are the busiest times at the feeders. This is a hummingbird photographers dream! If you are a guest at Casa Escondida B&B later in the season, you are likely to see the juvenile hummingbirds coming to the feeder. 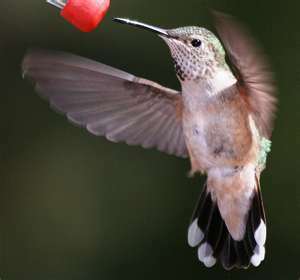 Hummingbirds need to eat large amounts of calorie-rich flower nectar every day. Depending on the time of year, hummingbirds can consume up to their own body weight in food! These types of calorie requirements make it necessary for hummingbirds to visit thousands of flowers each day. Casa Escondida Bed & Breakfast is located in a “high desert” area of northern New Mexico, so you may think that finding all the needed flowers and blooms would be a challenge but it is not. 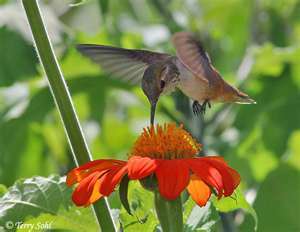 While the flower nectar makes up the majority of their diet, you may not know that hummingbirds also eat small insects like mosquitoes, aphids, gnats and the like. These beautiful and unique little birds of New Mexico will simply captivate you. Watching the hummingbird antics, while enjoying your morning coffee and relaxing beneath one of several covered porches at Casa Escondida B&B is the perfect way to start your day. We have wonderful rooms available throughout the hummingbird season. We look forward to having you and the hummingbirds as our guests! Copyright 2019. Casa Escondida Bed & Breakfast. All Rights Reserved.